Learn about the entire Migration Skills Assessment process of Engineers Australia, the assessing authority for most engineering occupations. Since it is going to be a lengthy process, use of navigation is suggested to skip or jump to different sections directly. Your Engineering Skills Assessment EA has laid out clear guidelines on how they would be assessing engineering skills. The most important aspect in the assessment is the pathway you are taking. Read More About the different pathways Here.Next bifurcation is the occupational category you are applying to. There are 4 occupational categories and EA has done a good job in clearly laying out what’s expected in each occupation. Read about different Occupations in the next section or click Here. Proficiency of English Language You are expected to show your proficiency in English Language. Though this might be waived off for those who have completed Australian Undergraduate Engineering Qualification or 2 years Masters Degree or PHD Program at Australian University. The waiver might also be on cards for those who are native English speakers (i.e. from Australia, USA, UK, Ireland, Canada (excluding Quebec), New Zealand).However EA reserves the right to request for an English language test if required. For migration purposes, Engineers Australia has recognized 4 occupational categories. However care must be taken that Engineering Manager is not an engineering occupation but belongs to Managers ANZSCO group; hence positive outcome might not allow automatic membership with Engineers Australia. One of the following English language test needs to be taken to prove the proficiency. Note: Your IELTS score should not be older than 2 years at the time of application. EA accepts TOEFL iBT test as a proficiency metric. Note: Your TOEFL score should not be older than 2 years at the time of application. Note: Your PTE Academic score should not be older than 2 years at the time of application. There are 5 different pathways for migration skill assessments. It is very easy to get lost in the terminology therefore to put in simple terms- there are 5 different routes for skill assessment. First is if your qualification is accredited by Engineers Australia – If the engineering program is accredited by Engineers Australia, then you would be permitted under this pathway. To find all the accredited programs, click here. Washington Accord: More about the Washington Accord Here. Sydney Accord : More about the Sydney Accord Here. There are further detailing in each of the accords. Due to brevity sake, we are not including all the fine details. If you are interested in knowing more about them, just fill in the form on the side and we will get in touch with you within 48 hours. 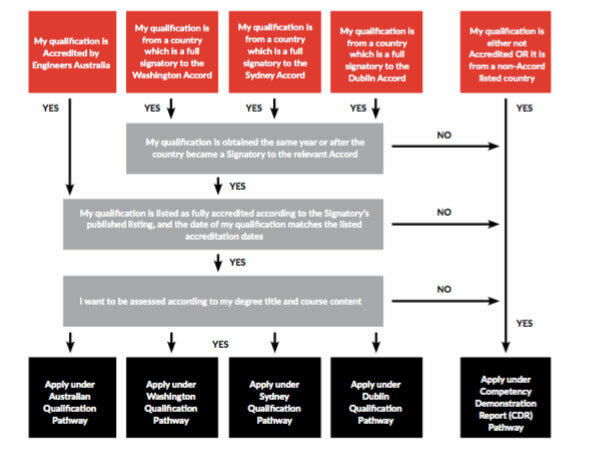 And then last is CDR Pathway where qualification is either not accredited or is from non-accord listed country. Under this pathway, applicant needs to prepare Competency Demonstration Report to show engineering skills. If one’s qualification is not accredited or the applicant is not from the accord countries, then one needs to prepare Competency Demonstration Report (CDR). It is primarily based on undergraduate qualifications and graduate competencies. Here is step by step chart to show how to prepare for CDR. 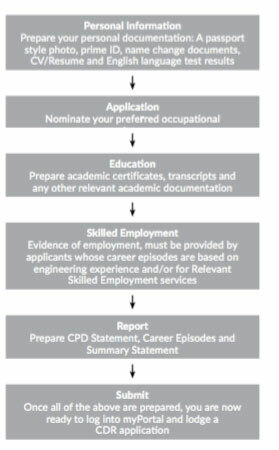 As is visible from the chart above, the key is the actual CDR Report where one has to prepare CPD Statement, 3 Career Episodes and a Summary Statement. Care must be taken to ensure that CPD is restricted to only 1 A4 Size page. Summary Statement: Summary Statement is culmination of your career episodes where result of your analysis is demonstrated. Engineers Australia has clearly laid out different formats for summary statement for different occupational category. These formats can be downloaded from Engineers Australia website. Read everything about how to write summary statement, go through our Summary Statement Writing guide. If you fall under the category where you have to prepare CDR for Engineers Australia and need professional help, do get in touch with us by filling up the form on the side.